On January 23rd, 2006 this blog opened for business which makes today my 11th Blogiversary (that’s 77 in dog years). Back then it was called Yidwithlid. But eventually I discovered Yidwithlid said to potential readers that only Jewish articles were posted here. Well that and Daniel Pipes drilled me a new one, saying the title was pejorative and an indication the prose wasn’t serious. I didn’t mean to be pejorative (okay sometimes my posts aren’t serious, but most of the time they are very serious and sometime they are meant to be pejorative-but only to people who are pushing falsehoods). Back then the blog looked like this, not the great new look it has today thanks to the folks at Liberty Alliance. The number 11 is an important number in the Jewish faith. The number eleven is important in that it can symbolize disorder, chaos and judgment. Coming after 10 (which represents law and responsibility), the number eleven represents the opposite – the irresponsibility of breaking the Law, which brings disorder and judgment. Which makes sense as one of my objectives in the site is to find irresponsibility and/or breaking the law of public figures and the liberal media. In Chapter 11 of the book of B’reishet (Genesis), men rebelled against God and built the tower of Babel. He judged them by confusing their language, resulting in chaos. The eleventh chapter of Sh’mot (Exodus) tells the story of the 10th plague the killing of the first born, God’s final punishment of the Egyptian people. In the book Bamidbar (Numbers) the Jewish people rebel against God because they want meat in their diet. 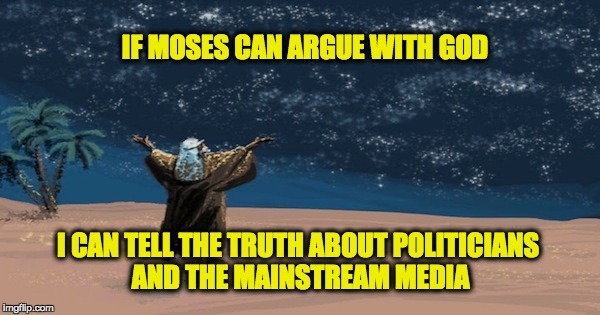 So if Moses could argue with the omnipotent creator of the universe to try and convince an angry Lord not to pour out his wrath against the Children of Israel. A much lower person than Moses (like me) can follow his example and challenge the power in government and the mainstream media to try and save the people of America. When the blog started in 2006 a good day saw 75 readers, today that is about ten minutes (not including the RSS Feeds, Facebook and the emailing list). Now an average day is 70x that number. This is the 14,157th post since that first day. There’s no way to report total traffic as I didn’t start keeping records till the site was about a year old and with the switchover last in October 2015 year the earlier records were rendered obsolete. Enemies have been made, usually by defending others. When my posts helped to oust Obama’s first NIC pick Chas Freeman, his son threatened to punch me in the nose, when my post revealing the Helen Thomas tape forced her to resign, people who considered her a mentor unleashed some venom on me. Perhaps the worst “anger” incited was when I refused to go #nevertrump, because I lost some good friends. The long list of friendships created only since entering the blogging community, have been a wonderful reward. So many others have invested the time to teach me so much–there is so much more to learn. Whether this is your first time to this site or whether it is your 14,157th time, it is impossible to express my appreciation for the fact that you the readers have taken a part of your busy day to read what is written here. As it is the tradition of Blogiversaries here at The Lid, below is the first post ever written for this site. Forgive me as I have jumped into this blog game kind of late. First let me answer the most obvious question. I am Jewish and I wear a Kippah, hence the name Yid With Lid. There are times when I just feel like ranting and raving so I will just do it here. Hopefully you will find those rants entertaining. Last night Discovery Channel ran a documentary that featured interviews with the real assassins who went after the Palestinian Terrorists who ran the Olympic Massacre. Once again it show that the Spielberg film is a fraud. Why would the Director who created Shindler’s List make a movie that is blatantly anti-Israel, and worse yet is based on a fraud? That’s right folks, the guy who wrote the book that Spielberg based his movie on claims to have first hand knowledge…he claims to be the head of the Mossad hit squad. Only one problem, he was NEVER IN THE MOSSAD. So what do you think? Is Spielberg creating a new movie genre? Will his next book be based on Clifford Irving’s fraudulent autobiography of Howard Hughes? Or those Fake Hitler Diaries that were published in Germany a few years ago? Pat Robertson says no. The movie Munich was just God’s way of punishing Spielberg for the movie 1941. Okay enough reminiscing, it’s time to put the sappy stuff aside and write some real posts. Thanks for visiting! And please keep on reading.